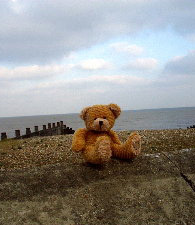 This is my boyfriend Luuk in Whitstable, in a little tiny corner of Kent. It was a gloomy day, but our moods were high anyway. I say, that is one fabulous bear!